Welcome to your studies at the Department of Physics, Meteorology, Mathematics and Computer Science at the Johannes Gutenberg University in Mainz! In order to make the beginning of your study program as trouble-free and quick as possible, you will find all important information, including a study guide, on the following page. At the beginning of every semester, the student councils of Physics and Meteorology, as well as those of Mathematics and Computer Science, offer orientation days for new students. We suggest that you use this opportunity in order to learn more about the structure of your academic program and to obtain useful advice on how to plan your course schedule. The exchange with experienced students will furthermore answer many of your questions and sweep your worries out of the way. You can find the dates for orientation days on the student councils' websites. The participation in a preparatory class is strongly recommended to new students. The Department of Physics, Mathematics and Computer Science offers preparatory classes in mathematics to prepare new science students for their introductory lectures. Classes start three weeks before the beginning of each semester. The attendance of preparatory classes is strongly recommended for all beginning students. In these classes, mathematical knowledge corresponding to the last two high school years will be repeated and raised to a level that the introductory lectures will build on. Students will have the opportunity to practice and improve their mathematical skills in small guided groups. The course for physics and meteorology will also cover a range of themes in physics. If you are studying mathematics AND physics as Bachelor of Education, please visit the preparatory class for physics, meteorology, chemistry, biology and geosciences. 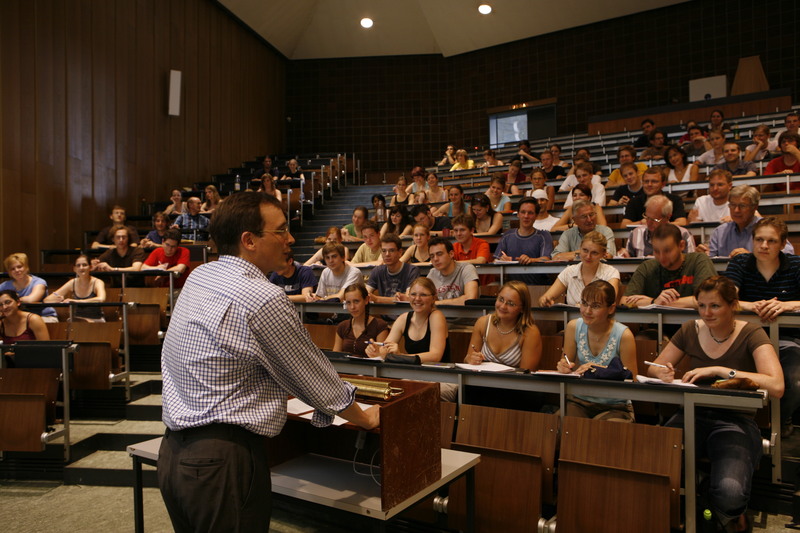 The Internationale Studien- und Sprachenkolleg (ISSK) at Johannes Gutenberg University offers a preparatory class for all students of mathematics and computer science. The course will repeat, refresh, deepen and assimilate the school knowledge and thus prepare for the introductory lectures. The day usually starts with lectures in the morning by an instructor explaining specific mathematical issues, followed by exercises in small learning groups in the afternoon. In addition, the course is a good chance to get to know the campus and meet your fellow students. A registration is not required. Late entries are welcome at any time. You can also participate even before graduating from high school. 2. Preparatory classes for physics, meteorology, biology, chemistry and geosciences. If you are studying mathematics AND physics as Bachelor of Education, please visit THIS preparatory class. The Department of Physics offers a preparatory class for all students of physics, meteorology, chemistry, biology, and geosciences. The course will repeat, refresh, deepen and assimilate the school knowledge in mathematics, show you possibly genuine new issues in physics and thus prepare you for the introductory lectures. The day usually starts with lectures in the morning by an instructor explaining specific mathematical and physical issues, followed by exercises in small learning groups in the afternoon. Mathematical lectures and exercises are supplemented by numerous topics of physics. In addition, the course is a good chance to get to know the campus and meet your fellow students. Always feel free to get in touch with the university’s contact persons and consulting offices. Most information are listed on this homepage. We wish you a good start in your academic life!